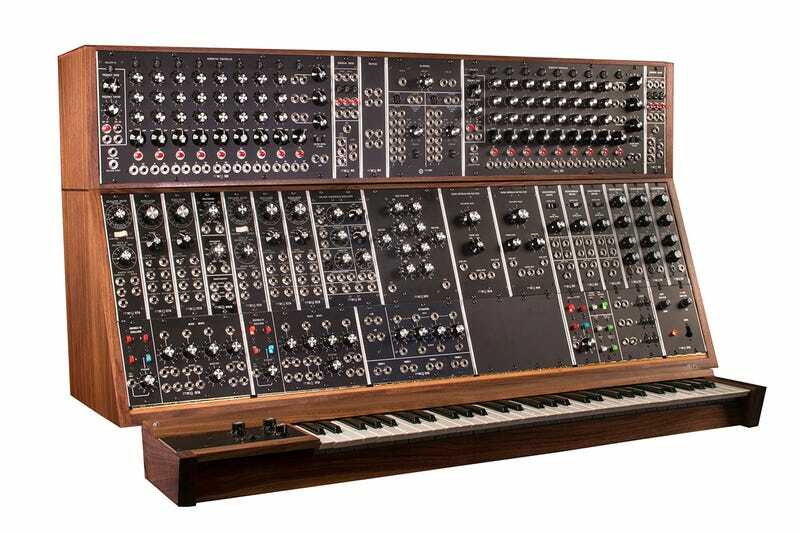 Moog's newly announced modular synthesizers aren't really new at all. They're recreated versions of giant hardware the company originally released in 1973. This is big news—like literally, the synths are huge. These days, you probably recognize Moog more for its (relatively) compact all-in-one synths like the Minimoog Voyager and Phatty lines. But before this road-ready synths were the norm, Moog was responsible for churning out modular systems that were responsible for some of the most legendary bleeps and bloops in history. In recent years, old school modular systems have made a comeback in the form of a boutique culture teeming with enthusiasts. The newly rebooted line of synths follows a three year project whereby Moog meticulously rebuilt Keith Emerson's legendary modular. The System 55 and System 35 both have built in keyboard. The former has 36 standalone analog modules for creating sound, the latter has just 22 standalone units. Meanwhile, the Model 15 is a more "portable" unit designed for road warriors. The synths are all hand-built from original schematics. Still, this isn't exactly a return to old form forever. The faithfully recreated Moogs are extremely limited and to own an oversized piece of synthesizer history you're going to have to pull out a big stack of dollars. There will be 55 System 55s for $35,000 each, System 35s, for $22,000 per each, and 150 Model 15s $10,000 each. Also, Moog made this gigantic video to celebrate the gigantic synths.